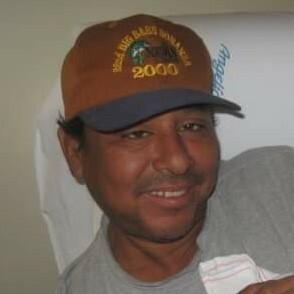 Justo Hernandez Jr., 59, passed away Friday, March 29, 2019 at a local hospital. He was born to Justo and Juanita Hernandez November 1, 1959 in Merkel. Justo worked as a laborer and at the cattle auction until he became disabled by an accident at the cattle auction. He was a jack of all trades and his knowledge of everything was extraordinary. Justo was proud of his military service serving in the U.S. Army from 1978 to 1980. He loved rock and roll, playing his guitar and having his family make up words to his songs. The love for his grandchildren was always “To the moon and back”. Justo loved to fish and was always full of great ideas for everything. Lately his biggest passions were gardening and his dogs. Justo is survived by his best friend and wife Cindy of Merkel; son Pedro; daughters Beth and husband Kevin of Bossier City, LA, Ashley of Merkel, and Melinda and Jessica of Waco; grandchildren Christopher, Natalea, Hailey, Emberly, Devon, McKayla and Ciara and one great grandson; sisters Rita and husband Refugio “Cuco”, Olivia, and Vicki all of Alverado, Lupe of Merkel, and Helen of Abilene; brother Richard of Pampona Beach, Florida; and many nieces and nephews. Justo was preceded in death by his parents; two sisters Amelia and Ester, and several nieces and nephews. A service of remembrance will be held at 10AM Wednesday, April 3, 2019 at Starbuck Funeral Home with Lance Perry officiating.